In order to achieve the best long-term results for your building in terms of comfort from proper heating and cooling measures, engineers and architects rely on proactive planning and precision building. This process works to deliver the best building envelope for your structure, which consists of all of the exterior components of your building working to keep the structure properly insulated. Doing so can reduce energy costs, increase building comfort and air quality, and reduce the risk of corrosion. When completed properly, a building design should benefit your building for decades to come. The quality of your building envelope will largely depend on the skills and precision of the crew assembling the walls, framing, and interior wallboards. AZ Drywall Finishing is here to serve as your trusted drywall contractors in Chicago, delivering high-quality outcomes for every build. We have the experience to help retail chains, healthcare facilities, and everything in between achieve the best quality to match every budget. We focus on keeping your building airtight to prevent any problems derived from Chi Town’s harsh winters. Today, we’ll conclude our tips that may help to enhance your building envelope design. If you’re ready to get to work, be sure to reach out to our commercial drywall company for an estimate! Foundation systems, including sealants and membranes to insulate footings and walls from the elements. Wall systems, which include stud framing, insulation, drywall, and taping measures to comprise an interior design that minimizes drafts, heat loss, and more. Exterior surfaces, including windows, doors, and caulking. These points are critical, as air can pass directly through gaps and surpass your building envelope. Roofing seals, which includes your roofing material in addition to flashing, sealants, and more. This element in the building design must be perfect to prevent environmental damages. If one aspect from the list above is not implemented properly, the safety and integrity of the entire building can be at risk. 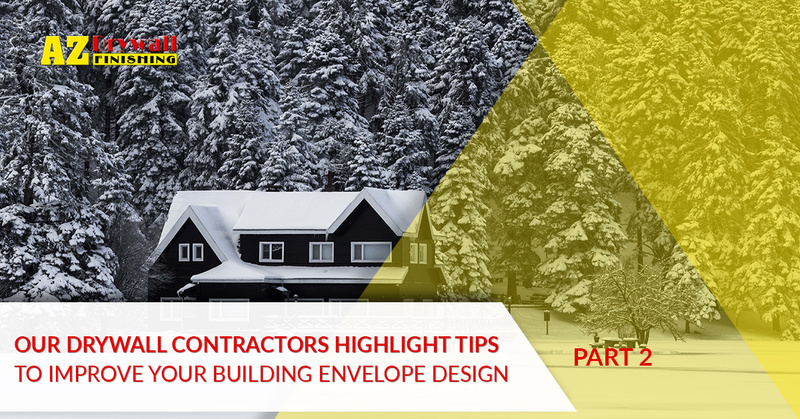 Complete building envelopes help to keep the elements outside. It’s essential to plan an effective approach to ensure that every piece of the puzzle fits, and AZ Drywall Finishing is here to help. We can work with you to create the best results for your building, and will happily communicate with other builders to ensure everything is finished correctly. Technology has helped to make energy audits more thorough than ever. Once you have completed your building design, it is highly recommended to test the results. A blower door is useful for sealing the front entrance to a structure, introducing positive or negative pressure differentials to check for leaks. Even the most experienced building and drywall contractors rely on this test for assured quality. Metal stud framing — Enhance the strength and stability of your building with expertly installed metal studs. Our drywall contractors excel in delivering efficient outcomes that perform exactly as expected. Drywall installation — Precision when installing drywall helps to eliminate much of the concern associated with building envelope designs. Our team will work with you to find the best approach for your project’s unique demands. Ceiling systems — While our acoustic ceiling tiles are utilized to reduce the sounds from high-traffic areas, they can also be used to minimize conditioned air loss. We’ll provide an aesthetically pleasing result that keeps your interior spaces optimally heated all winter long. No matter your industry or design plans, our commercial drywall company can deliver quality results. For nearly 20 years, our drywall contractors in Chicago have tailored precise outcomes for every client, ranging from food establishments such as Panera Bread to hospital campuses and beyond. Contact us today to learn more about our complete services, and be sure to request your project quote!